This high-quality series of 10 training videos is just what the doctor ordered. Here you get talking-head presenters showing you the way to success across a variety of different business models. In module 1, you will discover how to boost your traffic and ramp up your sales through the power of affiliates. In module 2, you will learn how to incorporate Twitter advertising to gain more traffic. In module 3, you’ll be taught how to split test your offers so you can improve your sales. In module 4, you’ll be introduced to e-learning and how it can be a significant benefit to you and your business. In module 5, you’ll learn how to use Facebook advertising to bring free traffic. In module 6, you’ll see how you can build your list through lead generation campaigns. In module 7, you’ll learn how to take some of the burden off your shoulders and find virtual help to help you grow your business. Why try to do everything yourself when there are qualified and skilled pros out there who can do it for you? In module 8, you’ll discover the power of paid search advertising and how to build your business bigger. Paid ads are very useful when done right as your traffic is guaranteed. Especially when you’re starting out and need immediate traffic and sales. In module 9, you’ll see how to create an awesome sales funnel. 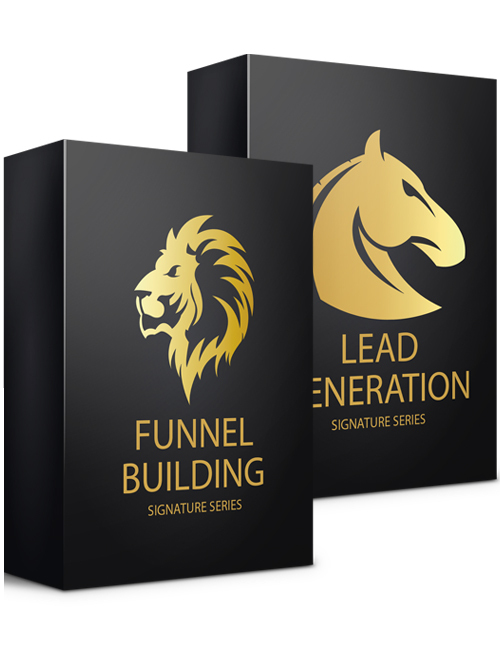 Funnels are incredibly powerful and are used successfully by pro marketers to convert visitors into buyers. And finally in module 10, you’ll learn about banner advertising and how to expand your traffic through one of the oldest and most proven online marketing methods. All 10 modules feature on-screen presenters. This is one hot pack of videos and ready for you to download. Please note that the file size for the Signature Series video course is 3 GB.